Microsoft today announced the much awaited and much loved Windows 10 Tech Preview for a bunch of phones. While many Lumia owners are happy to get their hands on the early build and some feel a bit disappointed as why their phone were not included in the list of first wave of the build. But, as said already, it is a slow process, and sooner or later more phones are to be included in the insider program as the feedback keep coming. Here is a list of supported phones, eligible to receive the first pre-release software. So, if you carry one of these devices, you're good to go. How to get the update on your windows phone, assuming your phone meets the requirements. Download the Windows Insider app from the store (QR Code below) and Launch it. Choose between insider slow and insider fast, depending on the type of connection that is available to you and how likely you want to get the updates. 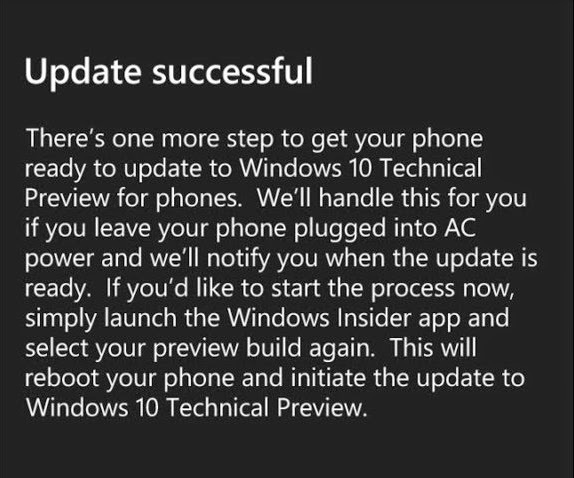 The phone may need to go through another step to get the Windows 10 build, as seen in the pic below. The Phone should now start downloading the update. Also, make sure the battery is charged to atleast 50% before you start installing it. It is not yet clear if the Preview for Developers program needs to be enabled or disabled during this process. The update could take upwards of 20 minutes but it will vary. You may also need to update to Windows Phone 8.1 build 14219 first before going to Windows 10 for phone. Do Share this post with your friends!